Choosing a car stereo can be challenging. With so many choices here are some tips to help you narrow down your search. We know this is a bad word in some circles, but you really need to know what you can afford before making any type of purchase, especially the “stereo type”. Okay, so it came with the car, but maybe that’s all you need. Many people don’t need the “bells and whistles” as they get most of their music from their digital music player and driving directions from their smartphone. If this is the case, just make sure your stock stereo comes with an aux jack otherwise you might be looking to upgrade your stereo rather quickly. If your stock radio only has AM/FM and maybe a CD player there are systems that will allow you to tune your radio to your music player. However, they are often unreliable and offer mediocre to low sound quality. Many times you can upgrade your stereo inside the dealership before you even roll off the lot in your new or used vehicle. These options come in digital, touchscreen, and even interactive. Understanding your vehicle and its capabilities is key to determining the right stereo system for you. If the shop doesn't carry what you are looking for with the internet and many car audio installation facilities, consider doing your homework. Again, understand your car and its capabilities. For example, if you have a car that doesn't have a satellite radio receiver the chances of you being able to make it work without purchasing additional equipment are about nil. Chances are if your car is a 2001 or before, you will need some additional hardware installed. If the budget works, you might consider this option. Stereo’s come in three types: audio, video, and GPS. Audio is straight forward. No fuss, no muss, maybe some glowing lights and a CD changer, but that’s about it. Video is the most brilliant as far as displays are concerned. 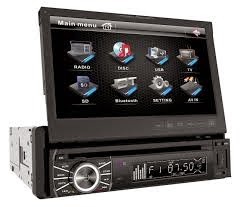 A video display generally offers a touch screen display that includes back up camera display, Directional Capabilities, and, of course, entertainment (radio, stereo, DVD’s, etc). An in dash GPS system is often similar to the video display, but the main difference is a GPS system offers directional capabilities, radio, and stereo components. In other words, it will get you where you want to go, play the radio, and maybe offer Bluetooth capabilities, but that’s it. Best of luck to you in searching for a car stereo! Plan your budget, figure out what you want, and do your homework. As part of your research call our professionals at the Olympia Automall. We’ll help you find the stereo that’s right for you. If you are looking for new or used car dealerships in the Puyallup, WA area, turn to the experts at the Olympia Auto Mall, your source for all things automotive!